Alhambra High School, the once D-minus school across the street has become one of seven Arizona schools to receive a Beat the Odds Gold Award. 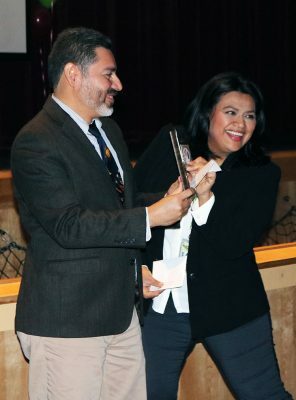 Current Alhambra principal Karen Cardenas and Claudio Coria, who was principal the last five years at the high school noted that much of the reason that the school has become a Beat the Odds Gold School can be cited to GCU’s on-going intervention and contributions to the local community. Alhambra High School was named a Gold School by the Future of Arizona’s Beat the Odds Institute. Marty Hoeffel (second from left) from the Future of Arizona, a former Alhambra principal, presented a plaque and banner to Alhambra’s current principal, Karen Cardenas (second from right), and her predecessor, Claudio Coria (center). It’s one thing to survive. It’s quite another to thrive. Six years ago, Claudio Coria refused to let school ratings and statistics derail his mission as the new principal of Alhambra High School, just down the street from Grand Canyon University. He was determined to lift Alhambra students out of the neglect they felt politically and economically. Alhambra was rated a “D” school by the Arizona Department of Education based on its students’ poor showing on the Arizona Instrument to Measure Standards (AIMS). The school also had a large refugee population, and that same year only 51 percent of its students passed the reading portion of the AIMS. But now, thanks to a number of initiatives — including a public-private partnership with GCU — Alhambra is thriving. The new Beat the Odds Gold award was cause for celebration at Alhambra High. 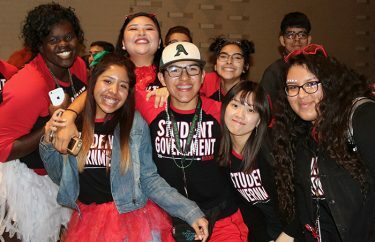 The school with minority-intensive, low income student populations recently was named a Gold School, the highest level of achievement awarded by the Future of Arizona’s Beat the Odds Institute. To earn the gold medal, schools must have a “B” or better from the Arizona Department of Education. In his new role as executive director of leadership for the Phoenix Union High School District, Coria still keeps a close eye on Alhambra — and he still appreciates the school’s partnership with GCU. “It was very evident to me when I was principal and now from the district office level that GCU’s investment has made a meaningful difference in the school’s significant improvement,” Coria said. Using the inspiration and methodology of best-selling author, researcher and teacher Jim Collins, Beat the Odds is a rigorous, multiyear, school-improvement program based on research and six keys to success — a strong and steady principal, a clear bottom line, ongoing assessment, collaborative solutions, programs built on individual student needs, and commitment to Beat the Odds. Marty Hoeffel from the Future of Arizona, a former Alhambra principal, presented the plaque, medal and banner to Coria and current Alhambra principal Karen Cardenas last month. After the recognition, both Cardenas and Coria noted that much of the reason that the school has become a Gold School can be attributed to its students’ access to GCU’s Learning Lounge and the University’s help with dual enrollment and teacher professional development. “It’s a big deal because it takes many years to get recognized as a Gold School,” Cardenas said. “This began with Mr. Coria five years ago, and there has been a continued focus on student learning, professional development for teachers and strong leadership. It validates a journey beyond test scores. Coria (left) and Cardenas show off their golden plaque, a symbol of teamwork, consistency and collaboration. The Learning Lounge was developed in partnership with Alhambra in 2012 as part of GCU’s Strategic Educational Alliances Department and the University’s five-point plan to revitalize west Phoenix. The program provides free academic assistance and meals to students of any grade level and pairs them with GCU student mentors for one-on-one and small-group learning sessions. Coria said GCU also has invested in local families by providing facilitators for parent ESL classes at the high school and by improving public safety in and around the neighborhood through the Neighborhood Safety Initiative. In 2016, Alhambra, a D-rated school by the Arizona Department of Education three years earlier, was nine points away from being a “B” school. Alhambra seniors earned $2.7 million in college scholarships in 2014-15, up from $1.2 million in 2013-14. Alhambra is one of nine schools and one of only two high schools to be named a Beat the Odds Gold School this year.